Paper or plastic? It’s a debate that has raged for years about a variety of goods, including grocery bags, food packaging materials, lollipop sticks, personal care items and other single-use products. The latest item to make headlines is the humble straw. Plastic drinking straws are ubiquitous, but they may soon take a backseat to paper drinking straws. A series of highly publicized California rulings has sparked a growing movement to ban plastic drinking straws in the United States, with proponents citing environmental concerns. One of the newest laws on the California books makes it illegal for restaurant servers to give guests plastic straws unless asked. Several California cities have followed suit by enacting local ordinances that ban the distribution or sale of plastic drinking straws in some food-service establishments. And it’s not just in California. Several major U.S. cities are putting laws in place to discourage the use of plastic drinking straws and stirrers. Amidst the growing debate, public pressure has also driven businesses — from Starbucks and Bon Appétit to SeaWorld and Disney — to announce their own plans to eliminate plastic drinking straws. Americans love their straws. One estimate puts our use of this little tube of plastic at 500 million straws a day. As pressure to ban them increases, people are turning their attention to biodegradable or recyclable alternatives, such as straws made from hay, metal straws and, of course, paper drinking straws. The idea of paper drinking straws isn’t new. In fact, it’s an old solution to a timeless problem. For centuries, people used natural straws made from ryegrass, hay or other hollow plant stems. The problem is that the natural materials imparted an unpleasant flavor to beverages, and they disintegrated quickly. An inventor named Marvin Chester Stone tackled the problem by creating an “artificial straw” made of paper. Stone’s paper drinking straws, patented in 1888, were made by winding and gluing a strip of paper into a cylinder. The cylinder was then dipped in paraffin, making it water-resistant. These paper drinking straws still disintegrated over time, but they lasted longer than grass or plant straws and didn’t change the flavor of beverages. Stone’s invention took off, and paper drinking straws became the norm. But by the 1960s, technology had advanced enough that plastic drinking straws were cheaper to produce and more durable than paper drinking straws — a fact that appealed to the burgeoning fast-food industry. Which brings us to today. Backlash over our growing pollution problem has caused many consumers to turn their attention back to disposable paper drinking straws as an environmentally friendly alternative to plastic. That has left straw manufacturers scrambling to catch up. 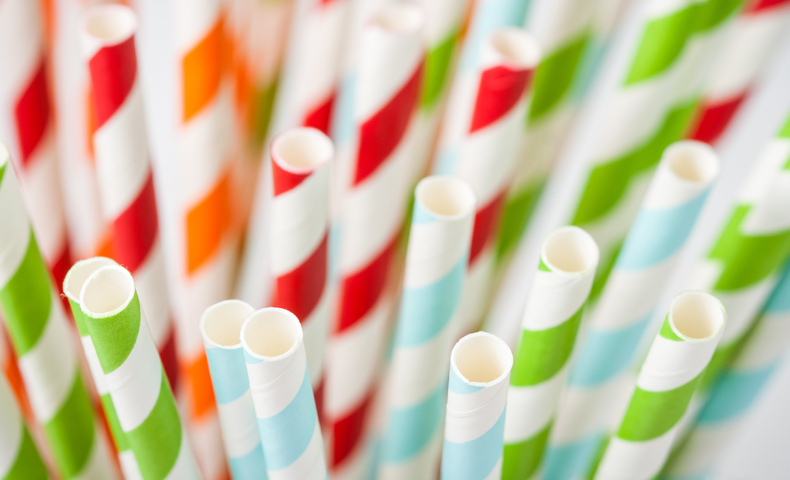 Peter Gilbert, director of Marketing and Customer Service for Domtar Specialty Papers, says Domtar is no stranger to paper drinking straws, having made paper for one of the largest paper straw manufacturers in the past. But before paper straws can grow from a niche market into a commodity, the industry will have to evolve the converting technology and the paper itself. Also, to withstand the rigors of converting, the specialty paper used for drinking straws has to be strong. “The converting process is very demanding; paper straws are made with three, sometimes four, layers of paper that are glued together to give the straws crush strength,” Gilbert says. Finally, the paper must be water-resistant so that the finished straw doesn’t fall apart in a drink, yet biodegradable to satisfy environmental concerns. Meeting these challenges will take time, but that’s not to say paper drinking straws won’t see a comeback — and soon.